Vernon Johns (1892 – 1965) was a minister who was active in the struggle for civil rights. He laid the foundation on which Martin Luther King Jr. and others would build. Dr. Johns was a competitive classmate at Oberlin of Robert Maynard Hutchins. Robert Maynard Hutchins (also Maynard Hutchins) (January 17, 1899 – May 17, 1977), was an educational philosopher, dean of Yale Law School (1927–1929), and president (1929–1945) and chancellor (1945–1951) of the University of Chicago. He was the husband of novelist Maude Hutchins. Although his father and grandfather were both Presbyterian ministers, Hutchins became one of the most influential members of the school of secular perennialism. "As I say,... place on one side of the line the ease that may be won by appropriating for ourselves anything we are fortunate enough to get hold of, place on that side of the line the physical security which may come from joining the strong and exploiting the weak, place on that side or perpetuate that security in the world by holding the weak and defenseless in a position of inferiority so that he cannot ask for his share of either honor or emolument. Place all of them on one side. Then, place on the other side of the line this sentiment: I want every child of man to be eligible for the good things of life which I want for myself. I want every thing and every value that I prize to be accessible to every manchild beneath these traveling stars. Place the first list of goods on one side of the line and this one sentiment of justice and equality on the other and, for every man standing in the presence of this choice, God says with Emerson: “take either you will, but you can’t have both... [Yes] You’ve got to make a choice between one and the other. [All right]." permission of the Heirs to the Vernon Johns Estate. Introduction and annotations © 2001 Dr.
Is Vernon Johns stating here a religious doctrine or a civic value? Except for his father, the theologians most influential in the life of Martin Luther King Jr., were Reverend Drs. Vernon Johns, Howard Thurman and Gardner Taylor, all of whom lived, worked and studied in Oberlin. Was Martin Luther King’s quest religious? Or civic? Or both? Who was Rev. Jerry Falwell? Were his quests religious or civic? Who is Benjamin Netanyahu? What is his religious claim? What is his civic goal? Who was Ayatollah Khomeini? Was he a civic or a religious leader? The Reverend Dr. Martin Luther King Jr. made several visits to Oberlin during the Civil Rights Movement. His first in February of 1957 was just a couple of months after he and the Montgomery Improvement Association successfully ended their 381-day bus boycott. It was during this historic boycott that King began to make a name for himself as a leader in the movement. Oberlin was fortunate to have Dr. King speak not once, but three times, during his visit. 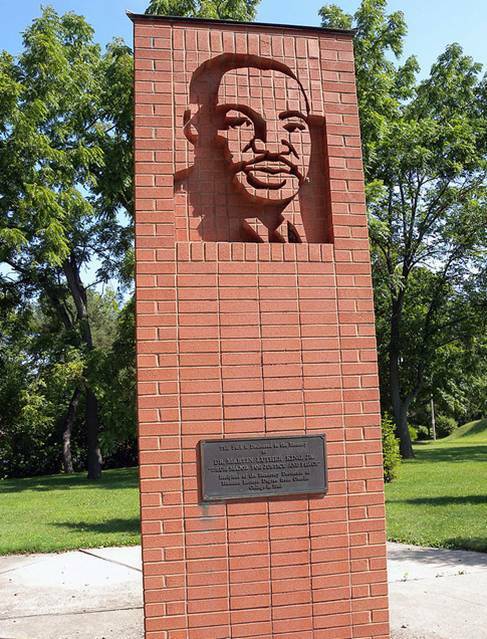 Dr. King's constant activism was proving to be quite a surprise to his Dexter Avenue Baptist Church congregation in Montgomery, who had appointed him in hopes that he would be less radical than their former pastor, Oberlin graduate Vernon Johns.